"Department of State" redirects here. For the term as used in Ireland, see Department of State (Ireland). The United States Department of State (DOS), commonly referred to as the State Department, is the federal executive department that advises the President and conducts international relations. Equivalent to the foreign ministry of other countries, it was established in 1789 as the nation's first executive department. The State Department's duties include implementing the foreign policy of the United States, operating the nation's diplomatic missions abroad, negotiating treaties and agreements with foreign entities, and representing the United States at the United Nations. It is led by the Secretary of State, a member of the Cabinet who is nominated by the President and confirmed by the Senate. The Secretary of State also serves as the nation's chief diplomat and representative abroad, and is the first Cabinet official in the order of precedence and in the presidential line of succession. The State Department is headquartered in the Harry S Truman Building, a few blocks away from the White House, in the Foggy Bottom neighborhood of Washington, D.C.; "Foggy Bottom" is thus sometimes used as a metonym. The current Secretary of State is Mike Pompeo, who ascended to the office in April 2018 after Rex Tillerson resigned. The U.S. Constitution, drafted in Philadelphia in September 1787 and ratified by the 13 states the following year, gave the President the responsibility for the conduct of the nation's foreign relations. These responsibilities grew to include management of the United States Mint, keeper of the Great Seal of the United States, and the taking of the census. President George Washington signed the new legislation on September 15. Most of these domestic duties of the Department of State were eventually turned over to various new federal departments and agencies that were established during the 19th century. However, the Secretary of State still retains a few domestic responsibilities, such as being the keeper of the Great Seal and being the officer to whom a President or Vice President of the United States wishing to resign must deliver an instrument in writing declaring the decision to resign. From 1790 to 1800, the State Department had its headquarters in Philadelphia, the capital of the United States at the time. It occupied a building at Church and Fifth Streets (although, for a short period during which a yellow fever epidemic ravaged the city, it resided in the New Jersey State House in Trenton, New Jersey). In 1800, it moved from Philadelphia to Washington, D.C., where it first occupied the Treasury Building and then the Seven Buildings at 19th Street and Pennsylvania Avenue. It moved into the Six Buildings in September 1800, where it remained until May 1801. It moved into the War Office Building due west of the White House in May 1801. 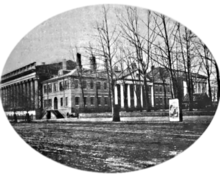 It occupied the Treasury Building from September 1819 to November 1866, except for the period from September 1814 to April 1816 (during which it occupied a structure at G and 18th streets NW while the Treasury Building was repaired). It then occupied the Washington City Orphan Home from November 1866 to July 1875. It moved to the State, War, and Navy Building in 1875. 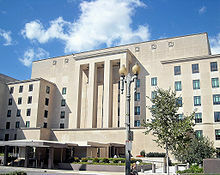 Since May 1947, it has occupied the Harry S. Truman Building in the Foggy Bottom neighborhood of Washington; the State Department is therefore sometimes metonymically referred to as "Foggy Bottom." Madeleine Albright became the first woman to become the United States Secretary of State and the first foreign-born woman to serve in the Cabinet when she was appointed Secretary of State in 1997. Condoleezza Rice became the second female secretary of state in 2005. Hillary Clinton became the third female secretary of state when she was appointed in 2009. In 2014, the State Department began expanding into the Navy Hill Complex across 23rd Street NW from the Truman Building. A joint venture consisting of the architectural firms of Goody, Clancy and the Louis Berger Group won a $2.5 million contract in January 2014 to begin planning the renovation of the buildings on the 11.8 acres (4.8 ha) Navy Hill campus, which housed the World War II headquarters of the Office of Strategic Services and was the first headquarters of the Central Intelligence Agency. Armed Department of State security agents accompany U.S. 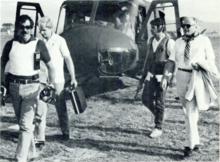 Ambassador Deane Hinton in El Salvador in the early 1980s. The Department of State conducts these activities with a civilian workforce, and normally uses the Foreign Service personnel system for positions that require service abroad. Employees may be assigned to diplomatic missions abroad to represent The United States, analyze and report on political, economic, and social trends; adjudicate visas; and respond to the needs of U.S. citizens abroad. The U.S. maintains diplomatic relations with about 180 countries and maintains relations with many international organizations, adding up to a total of more than 250 posts around the world. In the United States, about 5,000 professional, technical, and administrative employees work compiling and analyzing reports from overseas, providing logistical support to posts, communicating with the American public, formulating and overseeing the budget, issuing passports and travel warnings, and more. In carrying out these responsibilities, the Department of State works in close coordination with other federal agencies, including the Department of Defense, the Department of the Treasury, and the Department of Commerce. As required by the principle of checks and balances, the Department also consults with Congress about foreign policy initiatives and policies. The Secretary of State is the chief executive officer of the Department of State and a member of the Cabinet that answers directly to, and advises, the President of the United States. The secretary organizes and supervises the entire department and its staff. The Department of State has 75,547 employees (2018), including 13,855 Foreign Service Officers and 49,734 Locally Employed Staff, whose duties are primarily serving overseas. In addition, 10,171 employees form part of the predominantly domestic Civil Service. Under Secretary of State for Arms Control and International Security Affairs: This Under Secretary coordinates the Department's role in U.S. military assistance. Since the 1996 reorganization, this Under Secretary also oversees the functions of the formerly independent Arms Control and Disarmament Agency. Under Secretary of State for Civilian Security, Democracy, and Human Rights: This Under Secretary leads the Department's efforts to prevent and counter threats to civilian security and advises the Secretary of State on matters related to governance, democracy, and human rights. Counselor: Ranking with the Under Secretaries, the Counselor is the Secretary's and Deputy Secretary's special advisor and consultant on major problems of foreign policy. The Counselor provides guidance to the appropriate bureaus with respect to such matters, conducts special international negotiations and consultations, and undertakes special assignments from time to time as directed by the Secretary. Office of Global AIDS Coordinator: The President's main task force to combat global AIDS. The Global AIDS Coordinator reports directly to the Secretary of State. Since the 1996 reorganization, the Administrator of the United States Agency for International Development (USAID), while leading an independent agency, has also reported to the Secretary of State, as does the United States Ambassador to the United Nations. Diplomats in Residence are career Foreign Service Officers and Specialists located throughout the U.S. who provide guidance and advice on careers, internships, and fellowships to students and professionals in the communities they serve. Diplomats in Residence represent 16 population-based regions that encompass the United States. The Fulbright Program, including the Fulbright–Hays Program, is a program of competitive, merit-based grants for international educational exchange for students, scholars, teachers, professionals, scientists and artists, founded by United States Senator J. William Fulbright in 1946. Under the Fulbright Program, competitively selected U.S. citizens may become eligible for scholarships to study, conduct research, or exercise their talents abroad; and citizens of other countries may qualify to do the same in the United States. The program was established to increase mutual understanding between the people of the United States and other countries through the exchange of persons, knowledge, and skills. The Fulbright Program provides 8,000 grants annually to undertake graduate study, advanced research, university lecturing, and classroom teaching. In the 2015–16 cycle, 17% and 24% of American applicants were successful in securing research and English Teaching Assistance grants, respectively. However, selectivity and application numbers vary substantially by country and by type of grant. For example, grants were awarded to 30% of Americans applying to teach English in Laos and 50% of applicants to do research in Laos. In contrast, 6% of applicants applying to teach English in Belgium were successful compared to 16% of applicants to do research in Belgium. The U.S. Department of State's Bureau of Educational and Cultural Affairs sponsors the Fulbright Program from an annual appropriation from the U.S. Congress. Additional direct and in-kind support comes from partner governments, foundations, corporations, and host institutions both in and outside the U.S. The Fulbright Program is administered by cooperating organizations like the Institute of International Education. It operates in over 160 countries around the world. In each of 49 countries, a bi-national Fulbright Commission administers and oversees the Fulbright Program. In countries without a Fulbright Commission but that have an active program, the Public Affairs Section of the U.S. Embassy oversees the Fulbright Program. More than 360,000 persons have participated in the program since it began. Fifty-four Fulbright alumni have won Nobel Prizes; eighty-two have won Pulitzer Prizes. The Jefferson Science Fellows Program was established in 2003 by the DoS to establish a new model for engaging the American academic science, technology, engineering and medical communities in the formulation and implementation of U.S. foreign policy. The Fellows as they are called if chose for this program are paid around $50,000 during the duration and can earn special bonuses of up to $10,000. The whole point of this program is so that these Fellows will know the ins and outs of the Department of State/USAID to help with the daily functioning. There is no one winner every year rather it's a program that you apply for and follow a process that starts in August and takes a full year to learn the final results of your ranking. It isn't solely based on achievement alone but intelligence and writing skills that have to show that you encompass all of what the committee is looking for. First you start with the online application then you start to write your curriculum vitae which explains more about yourself and your education and job experience then you move onto your statement of interest and essay where you have your common essay and your briefing memo. Finally you wrap up with letters of recommendations and letters of nominations to show that you are not the only person who believes that they should be a part of this program. The Franklin Fellows Program was established in 2006 by the DoS to bring in mid-level executives from the private sector and non-profit organizations to advise the Department and to work on projects. Fellows may also work with other government entities, including the Congress, White House, and executive branch agencies, including the Department of Defense, Department of Commerce, and Department of Homeland Security. The program is named in honor of Benjamin Franklin, and aims to bring mid-career professionals to enrich and expand the Department's capabilities. Unlike the Jefferson Science Fellows Program this is based on volunteer work as you do not get paid to be a part of this. Rather you have sponsors or you contribute your own money in order to fulfill what it will take to do the year long program. The more seniority you have in this program determines what kind of topics you work on and the priority that the issues are to the country. Although the bottom line is that the other Fellows are the ones with the final say of where you are placed however they try to take into account where you would like to be placed. In 1978, the Bureau for International Narcotics and Law Enforcement Affairs (INL) formed an office to use excess military and government aircraft for support of foreign nations' counter-narcotics operations. The first aircraft used was a crop duster used for eradication of illicit crops in Mexico in cooperation with the local authorities. The separate Air Wing was established in 1986 as use of aviation assets grew in the war on drugs. Following the events of the September 11 attacks, and the subsequent war on terror, the Air Wing went on to expand their operations from mainly anti-narcotics operations to also support security of United States nationals and interests, primarily in Afghanistan and Pakistan. Safe transport for various diplomatic missions were undertaken, requiring the acquisition of larger aircraft types, such as Sikorsky S-61, Boeing Vertol CH-46, Beechcraft King Air and De Haviland DHC-8-300. In 2011, the Air Wing was operating more than 230 aircraft around the world, the main missions still being counter narcotics and transportation of state officials. In FY 2010 the Department of State, together with 'Other International Programs' (for example, USAID), had a combined projected discretionary budget of $51.7 billion. The United States Federal Budget for Fiscal Year 2010, entitled 'A New Era of Responsibility', specifically 'Imposes Transparency on the Budget' for the Department of State. The end-of-year FY 2010 DoS Agency Financial Report, approved by Secretary Clinton on November 15, 2010, showed actual total costs for the year of $27.4 billion. Revenues of $6.0 billion, $2.8 billion of which were earned through the provision of consular and management services, reduced total net cost to $21.4 billion. Total program costs for 'Achieving Peace and Security' were $7.0 billion; 'Governing Justly and Democratically', $0.9 billion; 'Investing in People', $4.6 billion; 'Promoting Economic Growth and Prosperity', $1.5 billion; 'Providing Humanitarian Assistance', $1.8 billion; 'Promoting International Understanding', $2.7 billion; 'Strengthening Consular and Management Capabilities', $4.0 billion; 'Executive Direction and Other Costs Not Assigned', $4.2 billion. The Department of State's independent auditors are Kearney & Company. Since in FY 2009 Kearney & Company qualified its audit opinion, noting material financial reporting weaknesses, the DoS restated its 2009 financial statements in 2010. In its FY 2010 audit report, Kearney & Company provided an unqualified audit opinion while noting significant deficiencies, of controls in relation to financial reporting and budgetary accounting, and of compliance with a number of laws and provisions relating to financial management and accounting requirements. In response the DoS Chief Financial Officer observed that "The Department operates in over 270 locations in 172 countries, while conducting business in 150 currencies and an even larger number of languages ... Despite these complexities, the Department pursues a commitment to financial integrity, transparency, and accountability that is the equal of any large multi-national corporation." Since 1973 the primary record keeping system of the Department of State is the Central Foreign Policy File. It consists of copies of official telegrams, airgrams, reports, memorandums, correspondence, diplomatic notes, and other documents related to foreign relations. Over 1,000,000 records spanning the time period from 1973 to 1979 can be accessed online from the National Archives and Records Administration. In the latest Center for Effective Government analysis of 15 federal agencies which receive the most Freedom of Information Act (FOIA) requests published in 2015 (using 2012 and 2013 data, the most recent years available), the State Department was the lowest performer, earning an F by scoring only 37 out of a possible 100 points, i.e. failed the grade, unchanged from 2013. The State Department's score was dismal due to its extremely low processing score of 23 percent, which was completely out of line with any other agency's performance. The Department's blog, started in 2007, is known as Dipnote, and a Twitter account is maintained with the same name. The internal wiki is Diplopedia. The internal suggestion blog within State is called the Sounding Board and their internal professional networking software, "Corridor", is a success. Finally, State has embraced e-government, establishing in May 2009 the Virtual Student Federal Service (VSFS). In 2009, the State Department launched 21st century statecraft. The U.S. Department of State's official explanation of 21st Century Statecraft is: "complementing traditional foreign policy tools with newly innovated and adapted instruments of statecraft that fully leverage the technologies of our interconnected world." ^ Foreign Service local employees. "What We Do: Mission". Retrieved July 23, 2014. ^ Office of Management and Budget. "Table 5.2—Budget Authority by Agency: 1976–2021". Obama White House Archives. US government. Retrieved March 1, 2017. ^ "Department of State | USAGov". www.usa.gov. Archived from the original on November 25, 2016. Retrieved November 24, 2016. ^ "A New Framework for Foreign Affairs". A Short History of the Department of State. U.S. Department of State. March 14, 2015. Retrieved March 14, 2015. ^ "1 United States Statutes at Large, Chapter 4, Section 1". ^ "United States Statutes at Large, First Congress, Session 1, Chapter 14". Archived from the original on June 23, 2012. ^ Bureau of Public Affairs. "1784–1800: New Republic". United States Department of State. Archived from the original on May 1, 2013. Retrieved May 11, 2012. ^ a b Plischke, Elmer. U.S. Department of State: A Reference History. Westport, Conn.: Greenwood Press, 1999, p. 45. ^ Tinkler, Robert. James Hamilton of South Carolina. Baton Rouge, La. : Louisiana State University Press, 2004, p. 52. ^ Burke, Lee H. and Patterson, Richard Sharpe. Homes of the Department of State, 1774–1976: The Buildings Occupied by the Department of State and Its Predecessors. Washington, D.C.: US. Government Printing Office, 1977, p. 27. ^ a b Michael, William Henry. History of the Department of State of the United States: Its Formation and Duties, Together With Biographies of Its Present Officers and Secretaries From the Beginning. Washington, D.C.: U.S. Government Printing Office, 1901, p. 12. ^ Burke and Patterson, p. 37. ^ Burke and Patterson, 1977, p. 41. ^ "Definition of Foggy Bottom". The American Heritage Dictionary. Archived from the original on November 9, 2013. Retrieved November 1, 2012. ^ Alex Carmine. (2009.) Dan Brown's The Lost Symbol: The Ultimate Unauthorized and Independent Reading Guide, Punked Books, p. 37. ISBN 9781908375018. ^ Joel Mowbray. (2003.) Dangerous Diplomacy: How the State Department Threatens America's Security, Regnery Publishing, p. 11. ISBN 9780895261106. ^ This complex is also known as the "Potomac Annex". ^ Sernovitz, Daniel J. "Boston Firm Picked for State Department Consolidation". Washington Business Journal. January 14, 2014. Accessed January 14, 2014. ^ United States Department of State, Bureau of Diplomatic Security (July 2011). "Diplomatic and Consular Immunity: Guidance for Law Enforcement and Judicial Authorities" (PDF). United States Department of State. p. 15. Retrieved May 11, 2012. ^ "United States Department of State Mission Statement". US Department of State. Retrieved October 24, 2017. ^ Sievers, Lisa (June 4, 2013). "State Department submits terrorism report to Congress". BioPrepWatch. Archived from the original on June 15, 2013. Retrieved June 6, 2013. ^ Gill, Cory R. (May 18, 2018). U.S. Department of State Personnel: Background and Selected Issues for Congress (PDF). Washington, DC: Congressional Research Service. Retrieved June 23, 2018. ^ "Under Secretary for Management". State.gov. Retrieved July 26, 2009. ^ "1 FAM 360 Bureau of Medical Services (MED)". fam.state.gov. Retrieved July 19, 2017. ^ "Bureau of Medical Services". State.gov. Retrieved July 19, 2017. ^ Pincus, Erica (December 22, 2014). "The Science and Technology Adviser to the U.S. Secretary of State". Science & Diplomacy. 3 (4). ^ "Diplomats in Residence". careers.state.gov. Retrieved November 18, 2016. ^ "ETA Grant Application Statistics". us.fulbrightonline.org. Archived from the original on December 25, 2015. Retrieved December 25, 2015. ^ "Study/Research Grant Application Statistics". us.fulbrightonline.org. Archived from the original on December 25, 2015. Retrieved December 25, 2015. ^ "Fulbright Program Fact Sheet" (PDF). U.S. Department of State. ^ "IIE Programs". Institute of International Education. Archived from the original on July 28, 2014. Retrieved July 28, 2014. ^ "53 Fulbright Alumni Awarded the Nobel Prize" (PDF). U.S. Department of State. Archived from the original (PDF) on April 8, 2014. ^ "Notable Fulbrighters". U.S. Department of State. ^ "MacArthur Supports New Science and Security Fellowship Program at U.S. Department of State". MacArthur Foundation. October 8, 2002. Retrieved February 1, 2015. ^ "Jefferson Science Fellowship Program – U.S. Department of State". Retrieved February 1, 2015. ^ "About the Jefferson Science Fellowship". sites.nationalacademies.org. Retrieved October 31, 2018. ^ "Franklin Fellows Program – Careers". careers.state.gov. Retrieved October 31, 2018. ^ a b "US Department of State Magazine, May 2011" (PDF). ^ a b "United States Federal Budget for Fiscal Year 2010 (vid. pp.88,89)" (PDF). Government Printing Office. Archived from the original (PDF) on February 5, 2011. Retrieved January 9, 2011. ^ a b c "United States Department of State FY 2010 Agency Financial Report (vid. pp.3,80)" (PDF). US Department of State. Retrieved January 12, 2011. ^ a b c "United States Department of State FY 2010 Agency Financial Report (vid. p.62ff.)" (PDF). US Department of State. Retrieved January 12, 2011. ^ "United States Department of State FY 2010 Agency Financial Report (vid. p.76.)" (PDF). US Department of State. Retrieved January 12, 2011. ^ "What's New in AAD: Central Foreign Policy Files, created, 7/1/1973 – 12/31/1976, documenting the period 7/1/1973 ? – 12/31/1976". National Archives and Records Administration. 2009. Retrieved November 26, 2010. ^ "The Most Desirable Employers". BusinessWeek. Retrieved January 24, 2011. ^ "Hillary Clinton Launches E-Suggestion Box..'The Secretary is Listening' – ABC News". Blogs.abcnews.com. February 10, 2009. Archived from the original on April 29, 2011. Retrieved June 16, 2012. ^ Lipowicz, Alice (April 22, 2011). "State Department to launch "Corridor" internal social network – Federal Computer Week". Fcw.com. Retrieved June 16, 2012. ^ "Peering down the Corridor: The New Social Network's Features and Their Uses | IBM Center for the Business of Government". Businessofgovernment.org. May 5, 2011. Retrieved June 16, 2012. ^ "Remarks at the New York University Commencement Ceremony, Hillary Rodham Clinton". Office of Website Management, Bureau of Public Affairs. U.S. State Department. May 13, 2009. Retrieved October 15, 2017. ^ "21st Century Statecraft". The Office of Electronic Information, Bureau of Public Affairs. Retrieved July 23, 2014. Ronan Farrow (2018). War on Peace: The End of Diplomacy and the Decline of American Influence. W. W. Norton & Company. ISBN 978-0393652109. Wikimedia Commons has media related to United States Department of State. Wikisource has the text of a 1905 New International Encyclopedia article about United States Department of State.